Let's be more precise in use of "informal language" in gravity theory. Well yes and no. Free test objects move along Minkowski geodesics that are justified by an action principle that leads to the GR field equations, but at the same time there is no deeper physical explanation. I replied: No, free massive test objects move along timelike geodesics (inside local light cone) of curved space-time. Locally only inside the small LIF they appear to move on Minkowski geodesics (in segments small compared to radii of curvature). Z: But I think Jack has a point when he says that there is an explanation for flat space geodesic motion in GR, even if it has a distinctly formal feel to it. I replied: Formally, in the tetrad formalism. The gravity field (meaning #3) is the motion of an LIF described by a SO1,3 Lorentz group 4-vector e^I, I = 0 (timelike), 1,2,3 (spacelike) of Cartan 1-forms each of which is GCT scalar invariant! so what happened to spin 0 Brans gravity and repulsive spin 1 anti-gravity? Higgs mechanism gives them large mass. Are they part of the nuclear force? In sense of renormalization group running of the coupling constant ---> Salam's strong short-range Yukawa gravity? You can actually show that free test objects move along geodesics in GR. A Minkowski manifold is just a special case. Minkowski spacetime has inertial forces built in because our experience is that spacetime is locally almost exactly flat (and Minkowski spacetime is an idealization of that local experience) and inertia is a fact of our local experience. So using Minkowski spacetime to "explain" inertia is no explanation at all because it is simply assumed. At best, it becomes what Wheeler identifies as a "non-dynamical" boundary condition for cases where cosmic matter density is less than critical and it is imposed as an asymptotic condition at infinity. But cosmic matter density is NOT less than critical. That, now, is a measured fact, not speculation. So inertial reaction forces are in fact due to gravity in our universe. I don't get Jim's point. There is no Machian model that can explain the rest mass of the elementary particles the way the Higgs mechanism and QCD do in a quantitative fashion. Maybe the hologram theory can do it. That is speculation. However, it must be a future boundary. It can't be a past boundary. L. Krauss implies Wigner, VonNeumann, Stapp, Penrose are "New Age hucksters"
"New-age hucksters aside, consciousness is not the key." Some of Stapp's work concerns the implications of quantum mechanics for consciousness. Aren't you confusing "evidence" with "proof"? I would say a physical theory can have empirical support -- be supported by "physical evidence -- short of "proof". Where "proof" is evidence sufficiently compelling to (eventually) establish a professional consensus. Which is a historical process. According to the Duhem-Quine principle, from a purely logical standpoint any theory can be made to agree with any given finite set of empirical observations, by floating the required auxiliary hypotheses that are limited only by the theorist's creative ingenuity. So in order to justiour theory choice decisions we have to go beyond mere logical consistency to the naturalness and conceptual economy of the comparative theoretical explanations of the observed phenomena. Are you seriously arguing that the Machian explanations for the instantaneity and isotropy of inertial reaction are more natural than the anti-Machian explanations? After all, even Wheeler thought that Hoyle-Narlikar was a can of worms. RS: If I understand what Paul was saying correctly, it is that warrant for belief in the Machian explanation for the origin of inertia is less than or equal to, other explanations such as ZPF and this is plainly not so. PZ: It doesn't have to involve the ZPF specifically. Currently there is a whole raft of condensate models for the vacuum under active consideration which might naturally account for inertial reaction forces in an anti-Machian manner. this would be the "weight" of the test particle clamped to the Local Non-Inertial Frame (LNIF). This inertial reaction force (measured as "weight" - e.g. standing on a scale clamped to Earth, or clamped to a hovering rocket etc, a hovering helicopter etc) is completely contingent of no fundamental interest - not needing Mach's Principle to explain. I don't know what any of you mean by that key term. RS: First of all, we have the still unopposed logical argument Jim made several weeks ago, that comes to the conclusion that if we grant GR, we must grant M-E. That is an extremely powerful argument when it comes to assessing warrant for belief, because few are going to want to sacrifice GR. PZ: Didn't I just make a counterargument? To wit, that natural interpretations are available for GR in which gravity represents physical modification of a pre-existing inertial guide field, as accounted for in Einstein's 1916 geometric model by the objective gravitational deformation of the spacetime geodesics? PZ: In this view, what is left unexplained is the pre-existing inertial guide field, that as Woodward has correctly pointed out, is put into SR "by hand". If this pre-existing guide field is conceived as a property of the physical vacuum (not necessarily the ZPF), and this can be made to work under some deeper model for said vacuum, then as far as I can see there would be no need to abandon GR as a geometric model for gravity. JS: Trite problem. Curvature explains it. End of story. Almost "nuff said" If you like you can view curvature as topological disclination defect density in a 4D world crystal lattice (Hagen Kleinert), but then you need to explain the nodes - the lattice points of that lattice. PZ: If GR implied a generalization of Einstein's Machist 1905 relativity principle, the situation might be different; but the modern consensus is that 1916 GR does not actually support such a generalized relativity principle. As Woodward says, 1916 GR has strong anti-Machian features (as famously argued by de Sitter in early conversations with Einstein). I was today with a person close to the Vatican Astronomers who told me funny stories of Hawking and others in debates with the Arch-Bishop of Vienna over Hawking's recent book poo poohing God's necessity. PZ: Now Jack is saying that there is no need for a deeper explanation for inertial motion, which surprises me since Jack is working on a condensate model for the gravitational vacuum. JS: No need for a deeper explanation of the shape of geodesics outside Einstein's GR - curvature explains it. At a deeper level, my macro-quantum coherent condensate model shows how the tetrad fields emerge from the Higgs-Goldstone fields post-inflation as a low-energy effective c-number field theory. The phases of the vacuum field are distorted by Tuv. Tuv includes both real and virtual particles. However, real particles are only 4% of the whole. 96% of Tuv are virtual particles inside the vacuum. Dark energy = random plasma of virtual bosons - dominant negative ZPF pressure creates the repulsive anti-gravity accelerating our universe. RS: Honestly, if you want to examine the argument and see whether the form is valid and the premises are factual, that would be a great idea; but until someone finds some holes, I think we HAVE to say the Machian explanation obtains, or at least presently seems to obtain, on solid logical grounds. PZ: It's certainly news to me that there is an airtight argument to the effect that either we accept a Machian model for inertia, or we will be forced to abandon GR. I don't think even Woodward himself is claiming this. Correct me if I'm wrong. JS: Again I agree with Z! PZ: Of course this depends at least in part on how GR is physically interpreted. RS: Second is the physical evidence which every person on the planet judges differently. PZ: There are a number of persuasive empirical argument in favor of an anti-Machian model for inertia. JS: By inertia I mean rest masses of the elementary particles, leptons, quarks (Higgs) ---> hadrons (QCD). that's what I mean. I don't know what you guys mean. PZ: The criteria for theory choice are not limited to purely logical empirical agreement; one must also take into account the naturalness of the explanations within the theoretical context. JS: Again I agree with Z. Pure logic is over-rated. Of course, we don't want our arguments in physics to be logically inconsistent. However, there are many logically consistent models of the world that are wrong - don't fit the facts. RS: Most of Jim's experiments are showing low thrust figures and I'd suppose this is why you're saying the physical evidence is "marginal at best". That's fine to say, but those thrusts have always been a couple decades above the resolution of the measurement apparatus and in particular, Jim has always used the proper scientific controls to weed out spurious sources. This makes the experiments complex to analyze, so in order to make a real appraisal of the experiments, one needs to look carefully at them, which most are not willing to do. This single fact is the main reason the physical evidence is most often generalized as "marginal." PZ: But you have to show that such observations have no satisfactory explanation within any competing anti-Machian theory. 1) Jim's data may not be real. May be a systematic error? I am not saying that is a fact, only outlining the logical possibilities. Like much of parapsychology - marginal data is hard to interpret. If Jim's "thrust" can't be scaled up to make something fly in vacuum then like Gennady Shipov's torsion propulsion it's not of practical interest. Remember Shipov also has a working machine with marginal propulsion on film - though it does not fly yet. 2) Even if Jim's data is real as you say it may have a perfectly mundane natural explanation. 3) I find Jim's concept of Phi = c^2 totally incomprehensible even if Sciama also first wrote it down. Therefore, if Jim's data is explained by Jim's equation for Phi I will also find that incomprehensible and not of any serious interest until he has a flying model - even a small drone will do. Of course if someone shows me that Jim's Phi is a limit of Einstein's GR then I can understand it. PZ: Where is your argument? RS: Then also there are tests like the Rotator, which don't generate thrust at all, but merely demonstrate the Mach Effect. In this instance, the magnitude of the signal doesn't matter--what matters is the signal is found at all, and it is! Perhaps I ought not say the magnitude doesn't matter at all, the magnitude is still important to demonstrate scaling as per theory, and this is just what was found. So IMHO; I would not judge the physical evidence as "marginal" simply because most often it is in the uN region rather than the commercial mN region, nor neglect things like the proof-of-science rotator experiment simply because it doesn't generate useful force. I would however, agree that MUCH more needs to be done to validate or repeat these tests. The issue then is one of validation, not that the test results are marginal. PZ: Your argument amounts to claiming that such marginal observations, if confirmed, cannot be accounted for within any anti-Machian model for inertia. If that is your view, how can you be so confident about that? RS: Opinions will differ, especially about how to generate warrant for belief from the physical evidence, but what was Paul comparing the Machian explanation for the origins of inertia to? To models and theories that have NO physical evidence and NO logical proof in support. PZ: I think that is simply false. Are you seriously claiming that instantaneous and isotropic inertial reaction forces do not constitute powerful empirical support for anti-Machian theories of inertia? And what about the Higgs mechanism? Isn't that inherently anti-Machian? I have to disagree. I think at the current time, M-E theory has no peers. Ron, I don't think top guns in relativity will agree with your statement. What do you mean exactly? I don't think even Jim would agree with you if you are thinking only of his data - still marginal at best unless I am mistaken. references for forced motion in a 4D geometric model for gravity. modification of the "flat" (gravity free) inertial guide field (modeled geometrically in GR in terms of 4D spacetime curvature). absolute space. And I don't see how, as things stand, one could reasonably argue that the various "Machian" models for inertia are any less speculative. Of course the advantages of a local interaction model for inertia include being able to account for instantaneous isotropic inertial reaction in a natural, intuitive and mathematically straightforward manner. These kinds of questions are not hard to answer if it is assumed that we start in Minkowski SR with a "flat" inertial guide field, and then interpret the covariant "warping" of spacetime in GR as the objective physical modification of the pre-existing gravity-free inertial trajectories resulting from the influence of gravitating matter. Then the GR geodesics naturally serve as local dynamical references for forced motion in a 4D geometric model for gravity. Exactly what physically maintains the motion of free test objects along the spacetime geodesics in a flat or a curved spacetime is an interesting question, but since we now accept the reality of the "physical vacuum", it seems natural to suppose that a deeper theory of gravity and inertia will explain this in terms of local interactions between moving matter and the gravitationally distorted vacuum. No, it's the tensor curvature field that shapes the geodesics. You don't need a deeper theory for that. I would say that the Higgs mechanism of the Standard Model could provide some clues, if gravity is conceived as a physical modification of the "flat" (gravity free) inertial guide field (modeled geometrically in GR in terms of 4D spacetime curvature). shows how to do that. I think we are way beyond the point where where one could plausibly dismiss such ideas as the "idle metaphysics" of Newtonian absolute space. And I don't see how, as things stand, one could reasonably argue that the various "Machian" models for inertia are any less speculative. cuts through air more easily than a bus." I have to agree with Jack that the Higgs mechanism already represents an anti-Machian solution to the problem of the origin of inertia. As I understand it, the Higgs model involves local interaction between matter in forced motion, and the physical vacuum. Right. However, if one invokes the hologram model then the Machian idea reappears at a deeper level. But one needs retro-causal Wheeler-Feynman ideas on steroids to really get it to work in the sense of a grand Novikov self-consistent time loop in a "block universe" picture. Very speculative of course. Crazy idea - crazy enough to be true? adapted from Tamara Davis Ph.D. Gravity is the pattern of geodesics. > The inertia of test particles plays no role in the global pattern of the geodesics. > Inertia has to do with resistance when a force pushes a test particle off a timelike geodesic. I don't understand then what you mean by "explanation" of the origin of inertia? Yes, the question: What is the origin of inertia (and its measure mass)? can be interpreted in more than one way. The answer, or explanation, should encompass an explanation of why, when you push on an object, it pushes back on you with an equal and opposite force. JS wrote: The usual explanation given by Eugene Wigner for that is from Noether's theorem applied to the T3 translation group. Every continuous symmetry Lie group of the action has a conserved "charge" quantity. T3 is generated by linear momentum "charge" elements of the Lie algebra. I think Rovelli would say that the external force transfers momentum to the local gravity field piloting the test particle, and the local gravity field transfers equal and opposite momentum to the source of the external force. Agreed this is an interesting question. Here we must think of local stress-energy current densities since global field momenta integrals on spacelike surfaces need not be conserved in general. For example, the universe is not symmetric under time translation, so the total universe energy is not conserved. The dark energy density is constant, hence the total dark energy is increasing as the universe's expansion accelerates - approaching a finite asymptote to be sure. JW: That is, why is Newton's third law valid? There are, arguably, two parts to the answer to the question. One is: what is the stuff (Newton's "quantity of matter" updated) that has the property of inertia? JS: Easy, the Higgs field + virtual gluon plasma inside the confined hadron "bags" of QCD (this also includes all virtual quanta including fermion-antifermion pairs, but the gluons are probably the dominant term). JW: The second part is: why does it exert a reaction force on you, the agent providing the "external" force. Wilczek's argument using Einstein's second law and the usual calculation techniques for computing the local non-gravitational energy of a system is an answer to the first part of the full explanation of the origin of inertia. That is, it addresses (correctly) the question of 'what is the "quantity of matter"?' The answer being the sum of all of the non-gravitational energies in the region whose inertial mass is being computed. Wilczek, by the way, has been making this argument for a decade or more, and yet one still hears comments about the Higg's process being the origin of mass. The answer to the second part of a complete explanation of the origin of inertia is only hinted at by Wilczek in his section "Owning up on mass" where he allows as how there is more to the issue of mass and inertia than simply calculating the local non-gravitational energy and dividing by c^2. There are several possible answers to the question: what causes the reaction force when you push on something. One is the Newtonian answer: because that is the nature of things that have inertia. Another is that there is some ambient field present that responds to the acceleration of local objects and produces the reaction force. I would add that the hypothetical ambient field is not the gravitational field to separate this answer from the third possibility. That third possibility is that inertial reaction forces are produced by the gravitational interaction (via the field) with all of the other "matter" [stuff that gravitates] in the universe. When this possibility is analyzed in some detail, it turns out that you have to adopt the Wheeler-Feynman [Hoyle-Narlikar] action-at-a-distance picture to get it to work correctly. The simple calculations of Sciama and Nordtvedt then show that the condition that must be met for gravity to produce inertial reaction forces is that the total scalar gravitational potential, phi, must be a locally measured invariant equal to the square of the speed of light, and so on . . . .
JS: Wheeler Feynman influence functional from the future gives "jerk" radiation resistance for sure. However, I don't think anyone takes the Sciama-Nordtvedt calculation as anything more that a primitive toy model. If it was the leading term in the real GR then it might explain your data as a first approximation. However, I do not understand what "phi" means unless you can express it in terms of Einstein's GR. g00 = 1 + phi ? But what guv are you using? You can't use a cosmological metric to explain the rest mass of a single electron - the scales are too different, especially if Sakharov is correct and gravity is only an emergent "More is different" c-number low energy large scale effective field theory. So this issue of scales is very important. The rest mass is key. Of course the kinetic component contributes. That is not the conceptual problem. JS interjected: While the precise numbers for the lepto-quarks may not be fundamental (e.g. cosmic landscape WAP), that they are not zero is essential for the QCD calculation to work. So I think you are mistaken there. Wilzcek allegedly wrote :Then there's the Higgs particle, sometimes said to be the "origin of mass" or even "the God particle". . . . In brief the Higgs field (which is more fundamental than the particle) enables us to implement our vision of a universal cosmic superconductor and embodies the beautiful concept of spontaneous symmetry breaking. These ideas are deep, strange, glorious, and very probably true. But they don't explain the origin of mass -- let alone the origin of God. Although it's accurate to say that the Higgs field allows us to reconcile the existence of certain kinds of mass with the details of how the weak interactions work, that's a far cry from expaining the origin of mass or why the different masses have the values they do. And as we have seen, most of the mass of normal matter has an origin that has nothing whatsoever to do with Higgs particles." JS wrote: This is a Red Herring. Wlizcek is only saying that MOST of the mass is in his QCD calculation. He certainly is not advocating a Machian origin of mass in the original 19th Century sense. There is a very simple refutation of the whole idea. JW: Well, no. Gravity is modeled by Einstein's field equations. And there is a lot more to it than just a pattern of geodesics. JS: Wrong. Einstein's field equations simply determine the global pattern of geodesics. Tensor curvature is simply "geodesic deviation". How much external non-gravity force is needed to produce a given tensor 4-acceleration on a test particle is irrelevant to Einstein's field equations. The inertia of test particles plays no role in the global pattern of the geodesics. JW: As test particles, of course not. The geodesics, by the way, usually computed are local, not global. JS: Irrelevant - a quibble. A solution of Einstein's equations is implicitly the global geodesic pattern. JW: For example, free fall in the vicinity of the Earth, or for planetary orbits, free fall in the vicinity of the Sun. The gravitational effect of distant matter in these cases is not explicitly taken into account. GRT, after all, is a local field theory. JS: Inertia has to do with resistance when a force pushes a test particle off a timelike geodesic. JW: Yes indeed. It is the thing that causes the equal and opposite reaction force that the agent forcing non-geodesic motion experiences. And the question is: what causes that reaction force? JW: Well, no. That's not right. As Wilczek points out [above], the Higgs process is irrelevant. JS: No, as I showed above, you are misinterpreting Wilczek's test pulling it way out of context. JW: QCD just allows you to calculate the gluon energy in the nucleons of the object being pushed. And even if you allow for Einstein's second law so you can divide by c^2 to get the mass, that still doesn't tell you what the cause of the inertial reaction force is. JS: Basically it's Noether's theorem for the T3 group. You only get an inertial reaction force when the object in question is "clamped" (same as the hovering rockets firing in Hawking's picture below - there the steel of the cabin floor pushes you off geodesic with electrical force. You need to accelerate in order to stand still in curved spacetime. For example, our weight here on Earth. We are "clamped" to surface of Earth. We feel the electrical force of the Earth as weight because we are static LNIFs in the Earth's curvature field. Hawking explains this in "The Universe in a Nutshell." JW: Mach's principle -- stated as gravity (due to chiefly distant matter [which is not included in the customary solutions of Einstein's equations for local geodesics]) being the cause of those local reaction forces, not stated as constraints on cosmological solutions -- provides the answer to this question. And it all fits. Mach's principle [defined as the gravitational origin of inertial reaction forces] is already implicit in the EEP with it's prohibition of localization of gravitational potential energy. And so on. . . .
Well Jack, respectfully I do not agree. Insisting that a "Machian" explanation of inertia should provide some independent means of calculating the energy of the binding gluons in nucleons is not reasonable. The method of calculating the local non-gravitational energy of an entity is not at issue. The QCD calculation of the energy of the binding gluons is no different from, for example, the electrodynamic calculation of the interaction energy of two electric charges brought into close proximity. That interaction energy, of course, provided by a bunch of virtual photons, contributes to the total local energy of the system, and contributes to the inertial mass of that system. If one says that something more than the simple calculation of that interaction energy is required to account for the origin of the mass the energy contributes to the system does not imply that some different method of calculating the energy is required. The issue here is not the details of the calculation of the NON-gravittional energies of interactions of local sources and fields in QCD, QED, or classical electrodynamics. It is: does the calculation of those local energies of interaction divided by the square of the speed of light constitute a complete account of the origin of the inertial masses of the objects possessing those energies? If you read Wilczek's comments in "Owning up on mass", I think it fair to say that even he wouldn't claim that a calculation of the local non-gravitational energy of some entity constitutes a complete explanation of the origin of its mass. If it were, I should think he would have said that 100% of the origin of nucleon masses can be accounted for by multiplying the quark masses by c^2 and adding those energies to the gluon energy. He doesn't do that. That is, the inertial mass of an entity with non-gravitational energy E is just that energy divided by the scalar gravitational potential -- because that energy is equal to the gravitational potential energy m phi. The origin of the inertial mass of the entity is the action of the gravitational field on the non-gravitational energy possessed by the entity. So, calculating E is only half of explaining the origin of inertia (and its measure inertial mass). The other half is taking account of the action of gravity, which has nothing to do with the methods of calculating the local non-gravitational energies E.
I suppose you might ask the question: So what? Who cares if the origin of inertia is to be found in the gravitational interaction or not? Well, if you are looking for effects that might alter the inertia of, say, a starship (as you evidently are with your superconductor/metamaterial scheme), understanding how inertia arises would seem to be a desirable goal. Should either part of your scheme not work, some alternative will have to be found, or there won't be any starships and stargates. At any rate, not built by us. But it seems that there is an alternative. . . . The point is that any alternative Machian explanation must at least be able to calculate what Wilczek did. Andrew has suggested that QCD + EP = origin of inertia. Unpacking Andrew's equation, QCD means the calculation carried out by Frank Wilczek, well at least the calculation described by Wilczek in his delightful book "The Lightness of Being" published several years ago, where he shows that more than 95% of the mass of the nucleons arises from the energy of the gluons that bind the quarks. For those of you who do not have (and have not read) Wilczek's book, I've excerpted the key passages therein in the attached word file. The first two and a half pages are devoted to Einstein's "second law". Then follow several pages where he talks about the QCD calculation of the proton mass. It is worth noting that in this section Wilczek allows that the quark restmasses and the quark-gluon coupling constant are treated as freely adjustable parameters in this calculation, which only returns the binding gluon energy. That is, these parameters are adjusted to get the right value of the gluon energy. This is perhaps a bit less than what one might hope for in an explanation of inertia. The last three pages are where Wilczek comes clean about the sense in which his argument can be taken as an "explanation" of inertia, and explicitly states what is not explained in his argument. 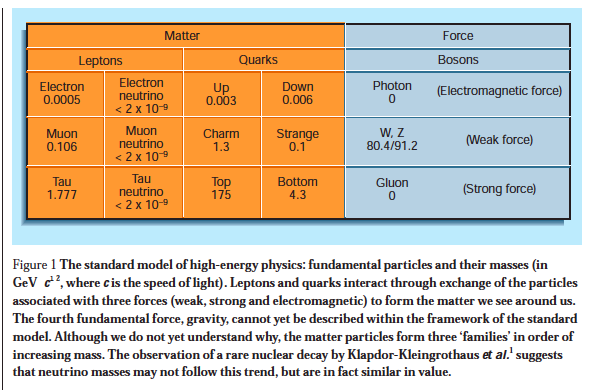 The (adjustable) quark and (non-adjustable) lepton masses, for example. In a nutshell, Wilczek's argument, which as far as it goes is correct, asserts that the inertial mass of nucleons is the sum of the non-gravitational energies associated with the bound quarks divided by the square of the speed of light. That is, Einstein's second law: m = E/c^2. This is more than 95% of the mass. Were one to multiply the (freely adjustable) quark masses assumed by c^2 and add that to the other energies, you'd have 100% of the inertial mass. Now, the question is: If one adds the Equivalence Principle to Wilczek's QCD calculation, does this constitute a complete explanation of inertial mass? Well, if we are talking about the "weak" EP, the answer is arguably no. The WEP merely asserts that the passive gravitational mass and the inertial mass are the same (and drop out of F = ma = GmM/r^2 => a = GM/r^2). Why? Because the active gravitational mass is left unaddressed, and in any event, it is the Einstein EP that is required to get GRT. The EEP differs from the WEP in that the EEP forbids the localization of gravitational potential energies. This may seem an incidental feature of the EEP unrelated to the issue of the origin of inertia and its measure, mass. But it is crucial. Active gravitational mass gets included in the EP in the variant known as the Strong EP (SEP). I also note that Mach's principle requires an action-at-a-distance representation of gravity (as Hoyle and Narlikar argued many years ago and Jack now includes in his future hologram view). Either that, or the "constraint" approach of Lynden-Bell and (independently) Wheeler. On other matters, this past week saw attention drawn to matters related to the "polarizable vacuum", a topic of particular interest to Hal, Eric, and Sonny (among others). I attach Hal's 2006 FoP paper on the subject as you may find it of interest. Jack circulated to another list an abstract of the paper he will be presenting at the 100 Year Starship convention in Orlando next month. It's his superconductor/metamaterial scheme which has been placed in the "exotic propulsion" section. The link to the agenda for that meeting is . An interesting collection of presentations. And some lucky organization will get a half megabuck (and a kiss goodbye) from DARPA and NASA on 11/11/11 with the proviso that the organization commit to working on starships for 100 years. On the experimental front, progress is slow. Bruce's dual resonance matcher didn't work as well as hoped on my last LA trip. And I didn't have time to track the source of the problem (thanks to the USPS, which had thoroughly loused up Carole's and my forwarding, necessitating a trip to the local PO). One of the new stacks, however, has been assembled into the mounting hardware, and I hope to get it onto the balance and do some preliminary testing next trip (next week). Comparison of the electrical characteristics of the new stack with the old promises that the new stack should perform nicely, with a little luck. I'm responding to this particular email because it is the most recent in this thread, not because I am singling out anyone's response. The conversation, from my point of view, has been interesting as it sheds light for me on how others are looking at the issues surrounding the "origin of mass" and Mach's principle. As it turns out, getting this right is central to understanding "Mach effects", and from the conversation it is clear to me now that I haven't succeeded in putting this in terms that are easy to follow. So, I'm going to take another pass at this, and I'm going to include in that pass a few excerpts from original papers so that there can be no confusion over what those authors say, and what I say that they say. Maybe we can make a little progress. . . . I believe the inertial force can be traced to Doppler shifts of the photons inside the sphere. 1916 typo, but yes. An internally-silvered sphere containing photons and/or fields will accelerate more slowly than an empty sphere under the influence of the same externally applied force. Therefore Higgs does not account 100% for inertia, as you say. The Real X-Files: What is not in "How the Hippies Saved Physics"
"Flash ahead about twenty years, to the mid 1990's. I can't recall the details -- but somewhere on the Internet I was introduced to numerous scientists interested in mind-to-mind communication, including former SRI physicist Hal Puthoff, thanks to alternative physicist Dr. Jack Sarfatti. Jack was excited about his idea of a post-quantum theory that allowed for mind-like qualities to interact across space and time. This was before Joe Firmage arrived on the scene, and Jack's attention turned towards exotic propulsion theory. It was an exciting time because of the impact of quantum information theory for theories of consciousness, like the Penrose-Hameroff theory. GB: I think that Dan showed up on Jack Sarfatti's email discussion list in early 2000, when Joe Firmage was funding UFO propulsion research at the International Space Sciences Organization. Dan and I disagree on many points -- I prefer the Many Worlds interpretation to Dan's Best Possible World -- so we have a fundamental philosophical divide, which keeps the discussion interesting. We also share an interest in secret activities of the government's phenomenologists, which were partly exposed with the release of the CIA STAR GATE files. GB: The material is intriguing, given some of Dan's sources, but I have yet to read anything that would convince me the government is about to make a major announcement. In 1983, an acquaintance from the USAF told me if I knew the truth about the UFOs I wouldn't be able to sleep at night. I don't know the source of his information, but the evidence suggests a counter-intelligence operation was in place at USAF bases. BR: Speaking of Ron Pandolfi, what's your take on him? GB: I have a lot of respect for Ron's position. I suspect he is curious about what is going on in the alternative science field, for reasons of national security. I usually hear from Ron when I publish something he wants retracted. I have been careful to use open-sources where Ron is concerned. Ron has requested that we avoid revealing sources and, more importantly, methods used by the Intelligence Community. GB: When it comes to serious interest in phenomenology, it's a fairly small world, where most of the key people know or are known to each other. It's also a dubious area for serious researchers, due in large part to the giggle factor. Most sources are on the public record about their research: physicists like Hal Puthoff and Eric Davis, independent creative minds like Jack Sarfatti. Some are retired from official government duty but remain active consultants, like Colonel John B. Alexander. Others are involved at a level that makes disclosure a risky prospect. They want to avoid anything that might affect their security clearance. BR: What opinions or thoughts do you have on time travel? Does it exist? GB: Time travel is an active area of research. It's taken more seriously on the theoretical level than it used to be. If time travel is possible then the best bet is to hitch a ride on someone else's time machine, because theory says you can't travel into the past before the time machine was created. If we want to travel into our own past, we will have to borrow a time machine that already existed during the period we wish to visit. In the many worlds of parallel universes, of the multiverse theory, time machines are how you move between different universes. Maybe some UFOs are time machines; if so, and you catch a ride, the multiverse theory of parallel worlds says you will arrive in the past of a different universe. You can never come home again." was partly motivated by our discussions of the limits of your PV model is that renormalization of the couplings must be scalar invariant under all the relevant symmetries of the dynamical action, this includes local frame transformations to and among accelerating non-inertial frames - even if the symmetry is spontaneously broken inside the material (e.g. continuous T3 is spontaneously broken to a discrete crystal lattice group in the ground state of a material even though the basic dynamics is still T3 invariant when one includes all relevant degrees of freedom - see P.W. Anderson "More is Different."). Just this morning I realized that it may be possible to get a nonlinear exponential amplification of the coupling of near field electromagnetic stress-energy current densities to the geometrodynamic tetrads and spin connection for really low power warp drive.